Bob Blumer (a.k.a The Surreal Gourmet) came into my cooking life thanks to my cousin Sophie who gave me his wonderful book “Off The Eaten Path“. I’ve always enjoyed beetroots but I know that many don’t so when I saw a recipe called “Gee, your beet smells terrific” I had to give it a try. It all comes down to roasting the beets which is a brilliant idea. It makes complete sense given how beets are packed with natural sugars, yet I’ve never seen this suggested anywhere before. Everyone who has this salad is stunned when I say the beets were roasted – they taste good. There are so many clever flavour combinations packed in here so I haven’t modified his recipe much, just tweaked a few quantities. Remove beetroots from the oven to cool. Don’t worry about the exterior blackening, the inside is wonderfully tender and sweet. Once cool peel with your hands and then finely dice the beetroots. Combine all the remaining ingredients in a bowl adding nuts and cheese last before gently mixing. For fancy presentation or as an entree spoon the mixture into whole washed endive leaves. 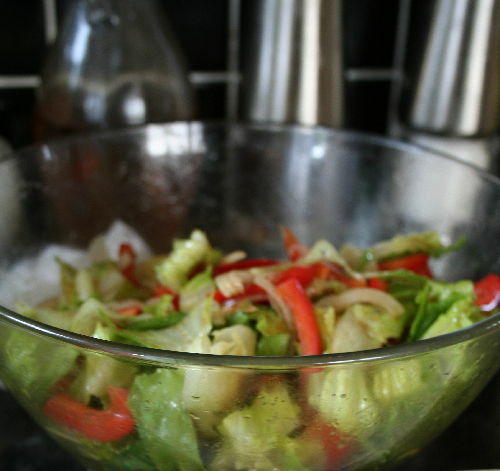 Alternatively use just 1 endive and chop the leaves into 2 inch lengths and mix into the salad.